In this weekly review of the Braves’ transactions, we focus a good deal on the pitchers. Some are attempting to stay in the majors for good while others are trying to work their way back. Elsewhere, one of Atlanta’s best young guns is back on the mound just a week after a liner had Braves fans holding their breaths after it struck him. A note on this report – moves referenced today took place between May 23 and May 29. I no longer refer to Taxi Squad, but extended spring training which is what sending a player to Danville technically refers to this early in the year. Many of them don’t actually head to extended spring, though. Prospect Numbers are derived from my preseason Top 50. Recalled: Matt Wisler…Wisler the Reliever, Part 2. Earlier in the year, Wisler came up and had two good outings and two rough ones – one in which he basically had to “wear it” as the Braves were pummelled 16-5. In two outings since returning, he’s thrown four perfect frames with two strikeouts. That, at least, is something to build upon. Wisler’s Triple-A ERA was high (5.20), but his FIP and xFIP were much more reasonable at 3.75 and 3.92 respectably. At the very least, I’d much rather see him in long relief than the next guy. 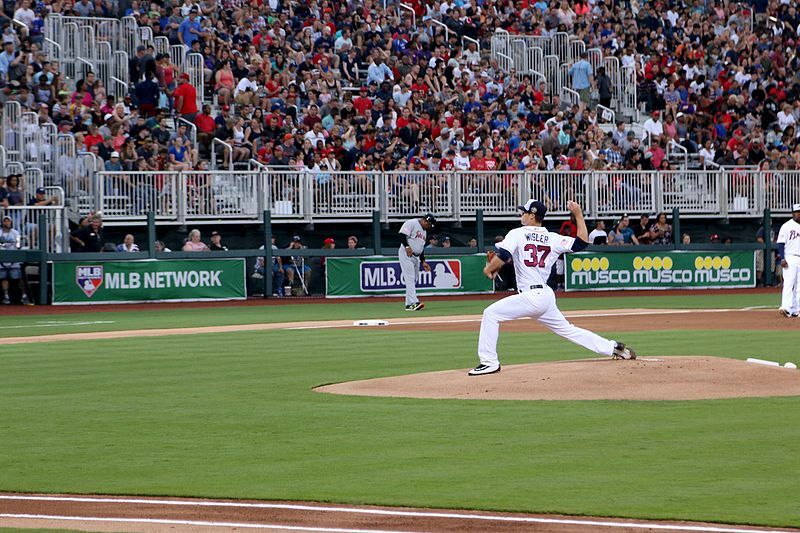 Designated for assignment and outrighted to Gwinnett: Josh Collmenter…Well, that didn’t take long. After 19 innings over three starts last September for the Braves, Collmenter can’t even duplicate the innings output in 2017. The problem was fairly fundamental. The Braves bought into his brief success without looking at the obvious flaws. His FIP was a good two runs higher than his ERA over those three starts and that’s ignoring two very troublesome seasons from 2015-16 as a whole. The Braves rolled the dice and quickly regretted it. Collmenter gave up one run for each of the 17 innings he pitched and often, those runs came on flyballs that haven’t landed yet (7 HR!). According to the Braves transaction page, he accepted a demotion to Gwinnett. 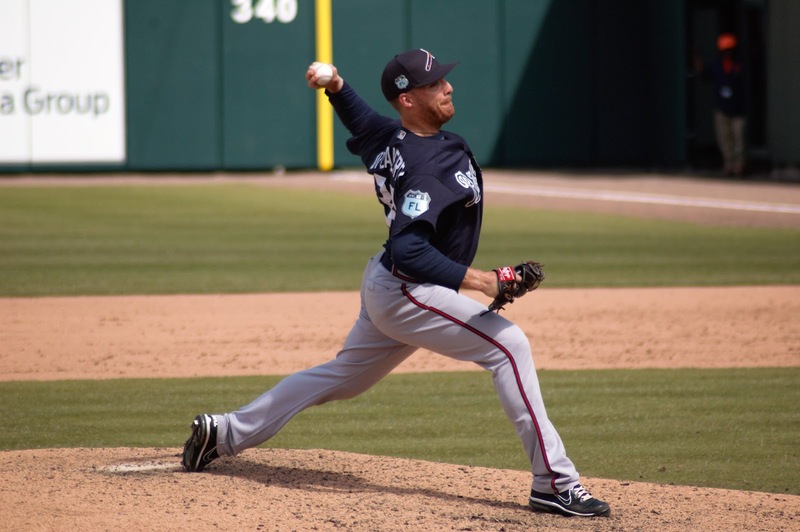 Activated: Enrique Burgos…The often wild, but electric Burgos worked a quiet first frame as a member of the Gwinnett Braves after he was acquired last week. Despite prolific strikeout numbers, the last time Burgos had a better than 2-to-1 strikeout-to-walk rate was back in 2014. He’s a project and at 26, probably not a project the Braves will have a wealth of patience to wait on. Outrighted: Anthony Recker…Rarely used in Atlanta, Recker was DFA’d last week after the flurry of trades and roster moves. He passed through waivers and elected to stick with the team. Promoted from Mississippi: Wes Parsons…For the second time, Parsons is now a Triple-A ballplayer. The first time came on April 28 when he made an one appearance run with Gwinnett. It’s been a long – often arduous – road for Parsons to get to this point. After a combined 142.1 innings over the last three years, Parsons had already reached 30.1 innings this year before the promotion. He’s probably a bit miscast as a reliever, but he still flashes plus-plus control. He worked a tough inning in his return, allowing three singles and a run while striking out two. Rehab: Adonis Garcia…So, Garcia had a four-hit game yesterday. He’s definitely coming back and it’s going to be pretty darn interesting what happens when he does. I have to believe that John Coppolella will wave off any lobbying by Brian Snitker and sent Emilio Bonifacio packing. When Garcia returns, he will likely settle into a platoon option, though knowing Snitker, we may get more of a timeshare than a platoon which ignores the best parts of Rio Ruiz and Garcia’s game. Rehab: Eric O’Flaherty…Last week, O’Flaherty hit the DL after aggravating his back giving up a homerun to Jose Bautista playing on the Toronto turf. He’ll likely join the Braves soon after already making his first rehab appearance with a perfect frame. But should the Braves really roll out the carpet to welcome back him? We were told that after having his elbow cleaned out last year, he was feeling better than he had in a few years. There were reports he was getting sink on his pitches once again. And then the data came rolling in and said otherwise. According to PITCHf/x, at his best, O’Flaherty was getting between 5.71 and 6.74 of vertical movement on his sinker. It’s down to 4.45 this season, which is actually very similar to last year’s 4.56. His fourseamer had between 8.11 and 9.27 inches of vertical movement. It’s been between 6.23 and 6.47 the last two seasons. He’s using his slider a lot more now and getting half of the depth as his best Braves years. In his favor is that he’s still handling lefties so far. That might be enough to get him back on the roster. But he’s not “back” in the deeper sense. Not even a bit. DL’d: Aaron Blair…Two years ago, Blair flashed plus-plus control with some newfound ability to induce his fair share of grounders. It made the Braves anxious to acquire him. Since coming to Atlanta, his control has never been worse (12.6 BB% this season), his strikeouts have never been worse, and his groundball rate has fallen ten points. Did the Braves rush him to the bigs last year? I don’t think so. Blair’s not making adjustments and that’s not the fault of the Braves. He quickly fell into the habit of nibbling last year after he got to the majors. It reminds me of how Mike Minor pitched once he got to the majors from 2010-2012. His fear led him to give up baserunners in bunches until he finally started to trust his stuff. When that happened, Minor posted a 3.5 fWAR during 2013. Will Blair follow a similar path or will he continue to regress? Hopefully, it will be the former. I’m not sure why Blair hit the DL, by the way. DL’d: Joel De La Cruz…He’s spent more of the season on the DL than on the active roster. When he has been healthy, the results have been pretty miserable. Remember that this was a guy who threw 62.2 innings for last year’s pitching staff. Promoted from Florida: Kris Medlen…After turning some heads with a six shutout innings in his 2017 debut, Medlen was roughed up by Clearwater last week for five runs in 5.1 ING. Nevertheless, he received a promotion up the ladder as he tries to work his way back into the picture. The control has been suspect, which you might expect from a guy working off the rust. 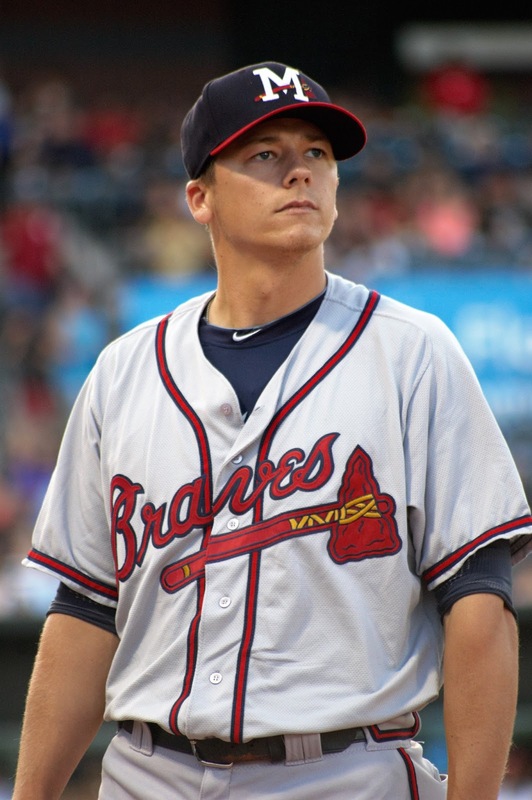 The Braves could use all the help they can get and if Medlen does make it all the way back, he’ll certainly force Atlanta to make a potentially tough decision. Activated: Stephen Gaylor…The left-hand hitting outfielder has played in just a dozen games this season and is off to a 3-for-30 start with two walks. An undrafted free agent back in 2014, Gaylor showed a decent enough hit tool until arriving in Carolina last year. It’s gotten much worse at Double-A. Activated: Danny Reynolds…Picked up after becoming a minor league free agent this offseason, Reynolds’ fourth season at Double-A has been a mixed bag. His groundball rate has shot up and his control is a bit improved compared to the previous two seasons, but his strikeouts have declined. His 5.48 ERA is a bit misleading – his LOB% is 56% – but his FIP and xFIP tell two different stories (3.33/4.56). Demoted to Extended Spring: Connor Lien (#36)…It’s hard to be too disappointed with Lien this year. With a deeper system than two years ago, he was no longer a borderline Top 20 prospect. Of course, his injury-riddled 2016 was also a factor. Though, even if he wasn’t a major prospect anymore, this season has been tough to watch Lien go through. He was hitting .187/.268/.343 at the time of his demotion with 59 K’s in 149 PA. That comes out to a nearly 40% strikeout rate – about 15% higher than his 2015 campaign. He has looked lost and unable to turn it around. Perhaps sometime at extended spring where he can clear his head will help. DL’d: Bradley Roney (#38)….It’s been a tough campaign for Roney, whose talented by wild arm had him pitching meaningful games in the International League playoffs last year. After opening the year on the DL, he headed to Florida in late April before a promotion to Mississippi. He was actually doing okay there and unintentionally walked just four of the first 36 he faced while striking out a dozen, but he’s now back on the DL. Promoted from Rome: Matt Gonzalez…Picked in the sixth round last year out of Georgia Tech, Gonzalez missed the first month of action while in extended spring training until a call-up after the first week of May. He then spent just 16 games in Rome, hitting .300/.355/.329. He picked up starts at third and in left and made a cameo at second base. It’s second base that might help Gonzalez find some playing time in Florida as Alay Lago has underwhelmed to this point. Demoted to Extended Spring: Andres Santiago…Often one of the names that fluctuates on-and-off the roster, Santiago has appeared nine times this year, including seven games with Florida. The results haven’t been there for the eleven-year veteran, though the strikeouts look great (21 in 14.2 ING). Released: J.B. Moss…To make room for Gonzalez, the Braves cut Moss, a seventh-round selection last year. Moss had blitzed the Appalachian League after being drafted, but the former Texas A&M star struggled with Carolina and then this season in his brief twelve games with Florida. Moss’s value with the Braves was tied into how much money he saved them by signing under-slot last June. It’s the tough thing about being signed less for your potential and more about allowing the team to sign the guys they actually want. Activated: Joey Wentz (#14)…Good to see the southpaw Wentz back out there on Memorial less than two weeks after taking a liner off his leg. He tossed four innings of one-run ball in his return with a walk and three strikeouts. On the year, Wentz has a 3.18 ERA and over a strikeout an inning. Promoted from Extended Spring: Ramon Osuna…With Rome getting little-to-no production from Anthony Concepcion and Kurt Hoekstra at first base, Osuna will get a chance to see if he can help out. A 14th round pick out of Walters State Community College in Morristown, TN last year, Osuna hit .276/.342/.423 with four homers in Danville. He struck out a ton (29%) and the former corner outfielder in college struggled with his new role at first base. Hopefully, an offseason of fine-tuning his skills will help him look more comfortable at first base. Demoted from Mississippi: Joe Rogers…The late-spring cut by the Tigers has shown up a number of times in this series as he cycled on-and-off the Mississippi roster while only pitching three games. Demoted to Extended Spring: Raymar Navarro…The Cuban righty has been limited to just five games with Rome this year. They have been successful for the most part, but the 26-year-old is not progressing up the depth chart despite pitching 67 innings last year at High-A. DL’d: Oriel Caicedo…There have been two Oriel Caicedos in professional baseball. Both were signed out of Panama by the Braves. One is 26 and hasn’t played since 2011 while the other recently hit the DL. Caicedo is no spring chicken at 23 years-old and made his debut in 2011…where he played with the other Oriel Caicedo. Seriously, this is something for me to obsess about. New Caicedo has impeccable control (just 71 unintentional passes in 411.2 innings), but also won’t pick up many K’s. He’s been a swingman throughout his career and this marks his third year with Rome. Not sure what sent Caicedo to the DL.